Dining at Disney World Restaurants is one of the highlights of many Walt Disney World Resort Vacations. 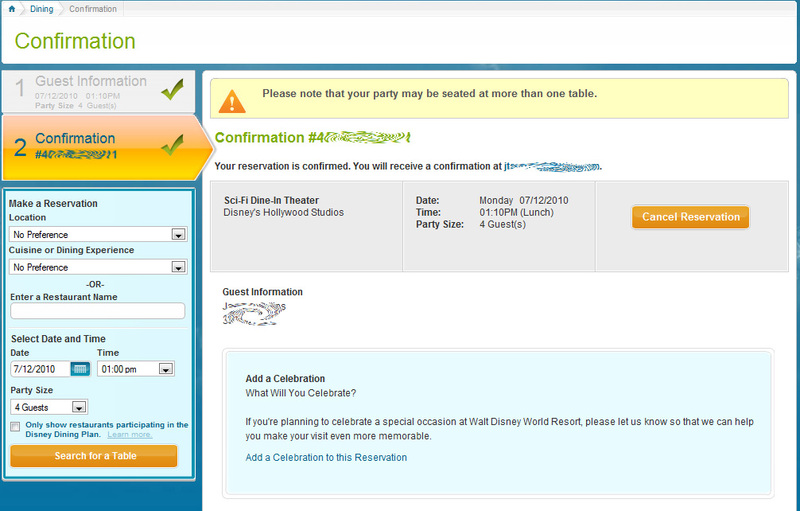 Now the process of making reservations for the Disney World Restaurants just got easier. There has long been the option of calling 407-WDW-DINE to make your reservations over the phone. 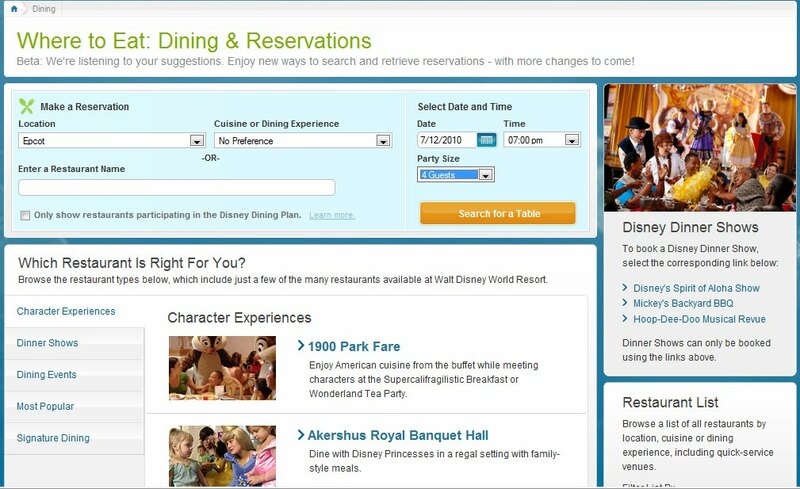 Last year Disney added the ability to make reservations on-line, and recently they upgraded their website and made on-line Dining Reservations easier to use and easier to see all of your dining options quickly. Disney World alllows you to make Dining Reservations at Restaurants located at the Walt Disney World Resort starting at 180 days prior to your Disney Resort check-in. If you are staying off-property then the window of opportunity starts at 180 days prior to the date you wish to dine. The process of making on-line Disney World Dining Reservations just got dramatically easier. It all starts at the Disney World website. From the above picture you can see the initial Disney Dining Reservation screen. Here you can choose the date, time, and the size of your party, as well as, Restaurant location (i.e. Epcot or Magic Kingdom) or Dining Experience (Character Dining or Casual Dining), or directly enter the Restaurant name if you are looking for a reservation at a specific one. In this example shown above we searched for a restaurant in Epcot on July 12th for a 7:00 PM Dining Reservation. The search returned 13 different restaurants within Epcot that have openings either in our target time or up to 2 hours before or 2 hours after our chosen time. 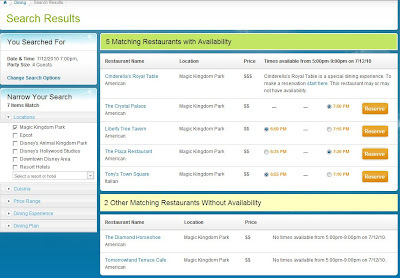 The search will also let you know which restaurants, if any, did not have any available tables for your party. If one of these choices meets your needs, all you have to do is hit the Reserve button and enter your name, email address, and phone number to make thee reservation. If you want to quickly see restaurant options in another area of Disney World for the same date, time, and party size, just click the check box on the left and get the new results. In the case above we chose to see what options were available at the Magic Kingdom. We saw that 5 restaurants had available space for our group, while 2 did not. Here is a close up look at some of the options you have to modify your search criteria. It is very flexible, even alllowing you to search by restaurant price. Once you have hit the RESERVE button to make your choice, you will get a screen like the one pictured above to enter your Guest Information. Again, all you need is your name, email address, and phone number to make the reservation. Most reservations do not require a credit card. At the end of the process you will see a screen that will give you a confirmation number. You also have the option to cancel your reservation if you have changed your mind. Afterward Disney will also send you an email with the confirmation information. New Dining Reservation System Is A Hit! Once you have tried Disney World's new Dining Reservation System we think that you will really like it. You can now check the restaurant that you are most interested in and see your other options quickly. If you just want to browse, you can do that too! As you plan your next Disney World Vacation, don't forget this great tool for taking care of all of your dining reservations. 1 comments to "Making Disney World Dining Reservations Just Got Easier"